Danny and I had talked about going to eat lunch together specifically to those places that our respective business partners don't want to go near, since they are both away bonding with their new additions. 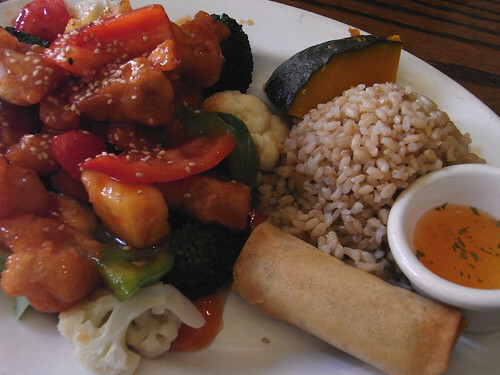 Wild Ginger, the local vegan restaurant, is the first of such outing. While Danny's been there multiple times, I had been wanting to go for a long time. One does not need to be vegetarian to enjoy vegetarian food. The lunch special is nicely portioned, starting with a soup and then the balanced main plate served with a tasty spring roll. Sort of reminds me of Eastanah, which we miss dearly.